God’s plan seemed clear for the devout Christian. Samuel was created to be an artist. Upon returning to the United States, Samuel turned his attention to portrait painting, traveling from town to town to offer his talent. And although his income was often meager, Samuel was very happy in the work. 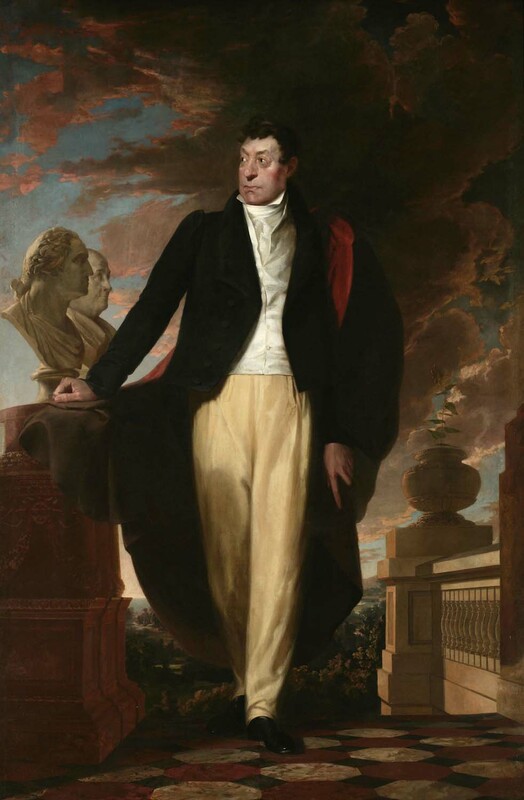 A proud moment came in 1825 when he was invited to paint none other than James Monroe, the fifth president of the United States. 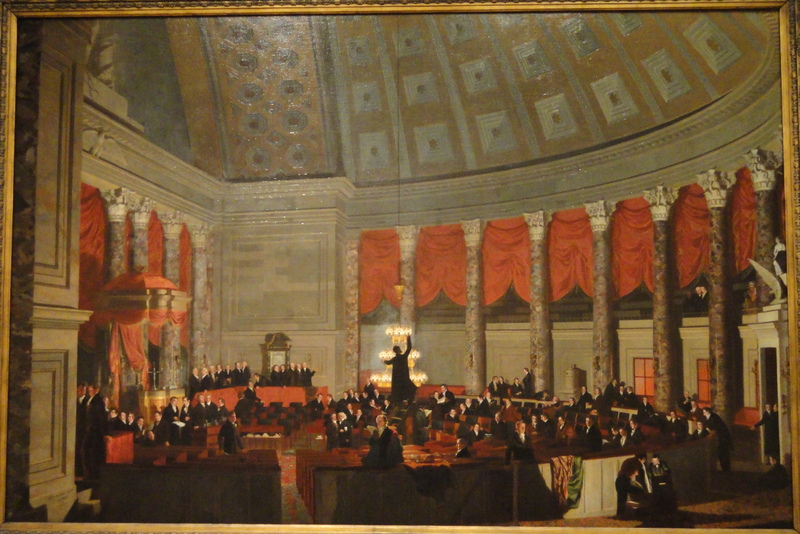 And while in Washington, Samuel was also commissioned to paint the French General, Marquis de Lafayette. Surely God was smiling his favor upon the artist’s success. Samuel received word that his wife, Lucretia, had died after the birth of their third child, back home in Connecticut. He rushed to New Haven, but by the time he arrived, Lucretia was already buried. His anguish was accompanied by frustration. If only there were a faster way to communicate across great distances, he thought. And he remembered another time of similar frustration. In 1811 when Samuel had first arrived in London, a second war between Britain and the United States was imminent. English ships were attacking American ships, suspected of carrying goods to Britain’s enemy, France. England did seek reconciliation with America, but before the letter arrived in Washington, America declared war on Britain. Slow communication caused hardship and pain at the end of that war also. After the peace treaty was signed, another major battle was fought because the generals didn’t know the war was over. 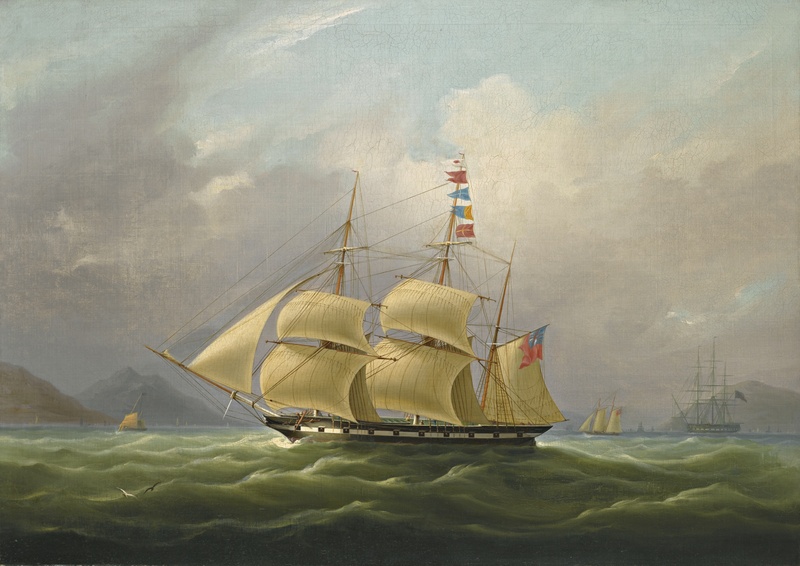 In 1832, Samuel was en route from Europe to America, after further study of painting, and happened to hear a passenger describe Benjamin Franklin’s experiment of passing electric current through miles of wire. The current had sparked instantaneously at the opposite end. And Samuel thought, Perhaps there is a way to make rapid communication possible. He began to devise plans immediately. Now one might think such a worthy endeavor, undertaken by a devout believer in Jesus, would receive God’s blessing, and the road from experimentation to completion would be level, smooth, and short. For years he worked through disappointments and setbacks. Finally, in 1842, Samuel applied for a patent. The next hurdle: to find financial support in order to put his invention to work. Two more years passed as Samuel tried to find backers, first in the U.S. and then in Europe. No one was interested. “I am perfectly satisfied that, mysterious as it may seem to me, it has all been ordered in view of my Heavenly Father’s guiding hand” (1). “The only gleam of hope, and I cannot underrate it, is from confidence in God…I will wait patiently for the direction of Providence” (2). Finally, the U.S. Congress allotted $30,000 for him to lay cable across the harbor between Baltimore and Washington, D.C.
Samuel invited the daughter of a friend to choose the first transmitted words. She selected a passage from scripture, knowing that behind Samuel’s passion and perseverance was the God who had inspired and sustained him. 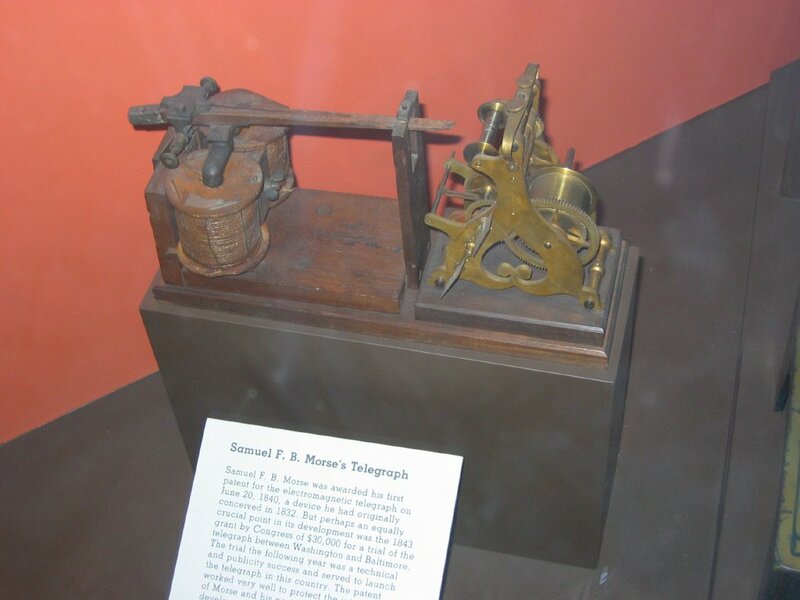 On May 24, 1844 in Washington, DC, Samuel tapped out the first telegraph message in a binary code he invented. It soon bore his name—Morse code. Instantly in Baltimore, the message was received: “What hath God wrought,” (Numbers 23:23). By the mid-1850s, more than 20,000 miles of cable had been laid across America. And by the mid-1860s, a cable was laid across the floor of the Atlantic Ocean, providing instantaneous communication between America and Europe. 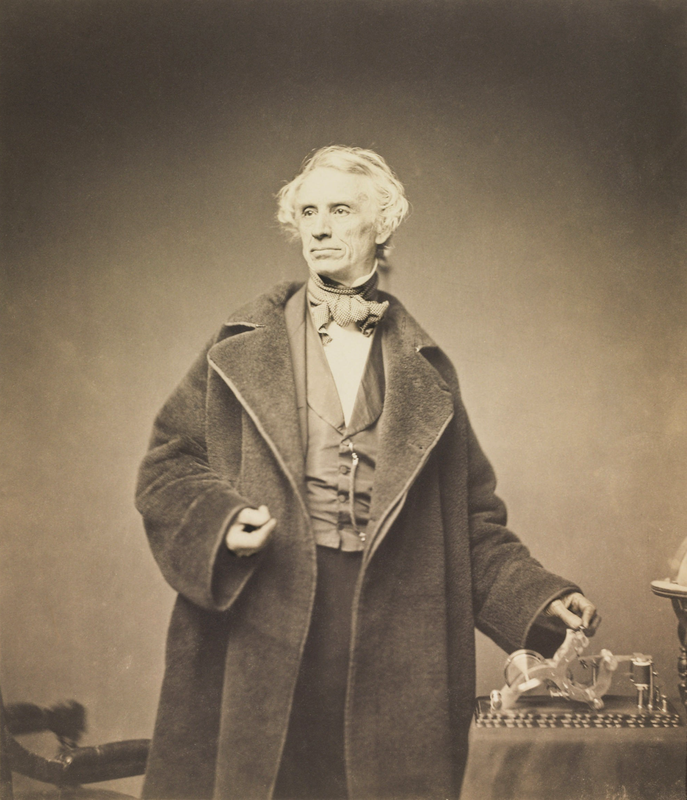 Samuel Morse became one of the most famous men in the world and acquired great wealth (much of which he donated to charity). “It is [God’s] work,” he wrote; “and He alone carried me thus far through all my trials and enabled me to triumph over the obstacles, physical and moral, which opposed me. ‘Not unto us, not unto us, but to Thy name, O Lord, be all the praise’”(3). Oh, yes—“To Thy name, O Lord, be all the praise”—in spite of the trials and obstacles that threaten. Thank you for the legacy of saints like Samuel Morse who teach us that even difficulties and disappointments have purpose: to teach us how to hope, persevere, and trust. Art & photo credits: http://www.wikipedia.org; http://www.wikimedia.com; http://www.wikipedia.org; http://www.wikimedia.com (2); http://www.wikipedia.org; http://www.flickr.com; http://www.wikimedia.com; http://www.dailyverses.net. P.S. We received the wonderful news this afternoon: Steve is now on the wait list (at least six months) for a liver transplant! Thank you all for your continued prayers of healing for him. So, so glad to hear the good news about Pastor Steve. Prayers work !! Thank you, Sue, and AMEN! GREAT NEWS about Steve!! And the one you tell here is remarkable!! I had never heard it – thank you! 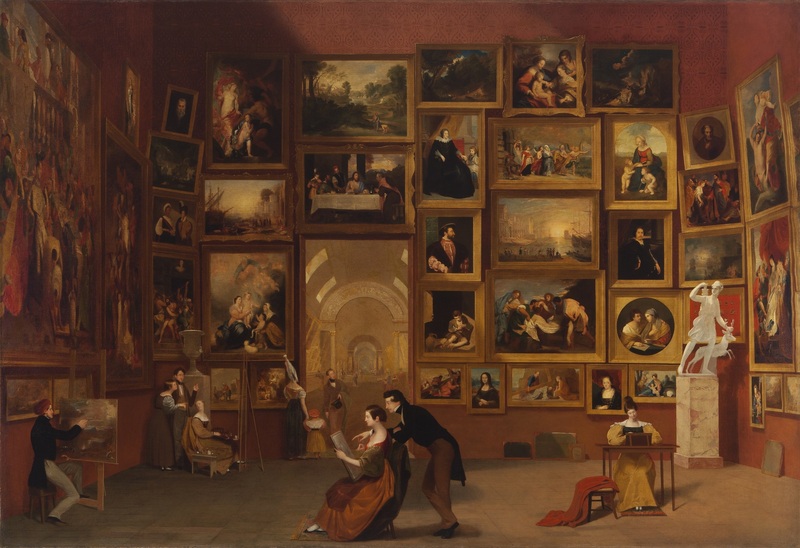 I did not know that Samuel Morse had been an artist AND (more importantly!) a Christian. I love discovering these stories of the heroes of our faith! Again, this makes me wish you had been my history teacher. Thank you, Grace! History SHOULD be taught with more stories. In an effort to cover (too) much information, curriculum writers often omit all the LIFE behind historical events! Thanks for this beautiful lesson and even more beautiful news about your husband!!! Thank you, Heidi. And yes, that news was indeed BEAUTIFUL to our ears! SO appreciate your prayers! 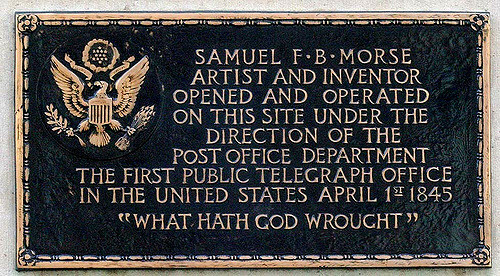 I had no idea that Samuel Morse was a CHRISTIAN or an artist! These two points got my attention: “I am perfectly satisfied that, mysterious as it may seem to me, it has all been ordered in view of my Heavenly Father’s guiding hand”; and “The only gleam of hope, and I cannot underrate it, is from confidence in God…I will wait patiently for the direction of Providence”. God’s timing is always perfect. Speaking of which, praise the Lord for your news about Steve! I am thrilled for you and Steve. NOTE: This is one of your best historical posts, Nancy. I loved learning about Samuel Morse. I always wondered about the ‘What God hath wrought’ and am so grateful that you researched him. 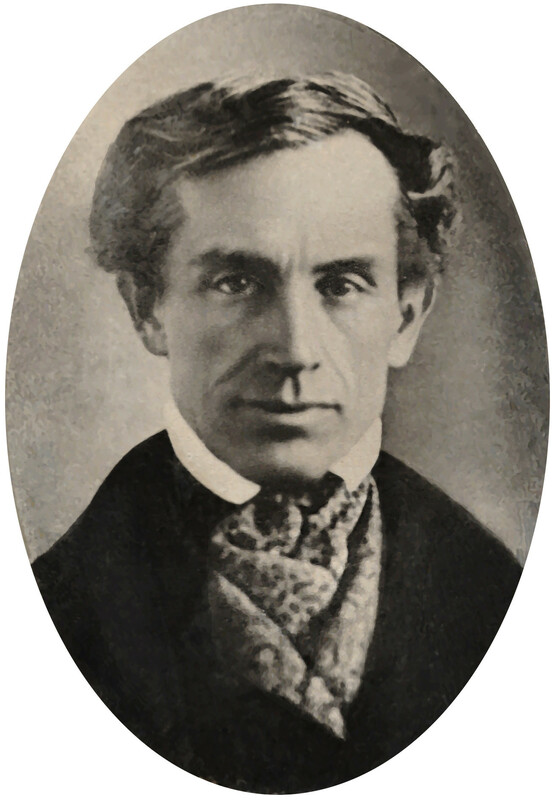 I knew very little about Samuel Morse myself, and am pleased you enjoyed learning about him, too. Thank you VERY much for your prayers for Steve. God’s power IS at work! Nancy, this is indeed a very interesting article and facts of which I was unaware. Thank you once again for great teaching ability. Continued love and prayers for you and Steve. Thank you, dear Ruth, for your encouragement and prayers! I never knew any of this story. Wow what a read. Thanks for bringing his life to my life! So glad you found inspiration in Samuel Morse’s story, Jean. You’re welcome! Inspired by Samuel’s patient resourcefulness and creativity and heartened by Steve’s news. The Lord be praised for ongoing inspiration and provision! Thank you, Laurie. And AMEN to ongoing inspiration and provision. 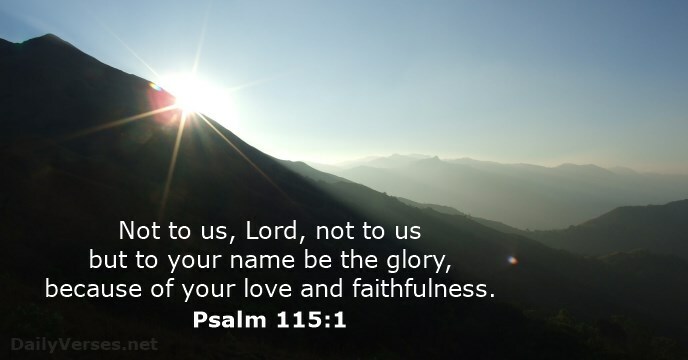 God IS to be praised for both…and for all!